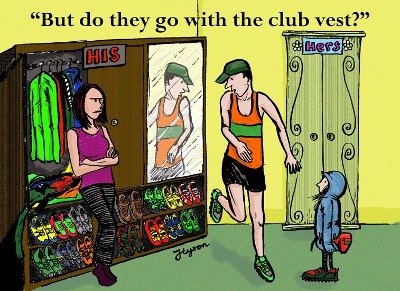 There's a wide range of official Ilkley Harriers kit available from both shops below, the most important item being the club vest which is essential if you're going to race. The 'original style' is plain red with a green chest stripe carrying the Harriers logo. Dobson and Robinson on The Grove still sell Viga vests in this design. The 'new style' is recognisable by the 'dotty pattern' in the red. These vests are sublimation priinted so have no seams, and they are more expensive. They are made by Fastrax and are only available from The Complete Runner on Leeds Road, Ilkley. where the team has to wear vests of the same design and we have opted for the 'original style' vest. The junior section requires juniors to wear the 'original style' vest for compettion.